Once upon a time two young men living in a small village fell in love with the same girl. During the winter it was all night except for an hour or so about noon, when the darkness seemed a little less dark, and then they used to see which of them could tempt her out for a sleigh ride with the Northern Lights flashing above them, or which could persuade her to come to a dance in some neighboring barn. But when the spring began, and the light grew longer, the hearts of the villagers leaped at the sight of the sun, and a day was fixed for the boats to be brought out, and the great nets to be Spread in the hays of some islands that lay a few miles to the north. Everybody went on this expedition, and the two young men and the girl went with them. They all sailed merrily across the sea, chattering like a flock of magpies, or singing their favorite songs. And when they reached the shore, what an unpacking there was! For this was a noted fishing ground, and here they would live, in little wooden huts, till autumn and bad weather came around again. 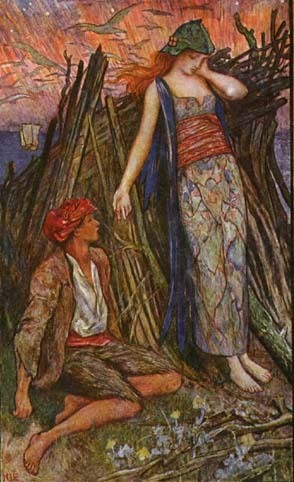 The maiden and the two young men happened to share the same hut with some friends, and fished daily from the same boat. And as time went on, one of the youths remarked that the girl took less notice of him than she did of his companion. At first he tried to think that he was dreaming, and for a long while he kept his eyes shut very tight to what he did not want to see, but in spite of his efforts, the truth managed to wriggle through, and then the young man gave up trying to deceive himself, and set about finding some way to get the better of his rival. "Oh, dear, what shall I do! I have left my best knife behind in the hut. Run, like a good fellow, and get it for me, while I raise the anchor and loosen the tiller." Not thinking any harm, the youth jumped back onshore and made his way up the steep bank. At the door of the hut he stopped and looked back, then started and gazed in horror. The head of the boat stood out to sea, and he was left alone on the island. Yes, there was no doubt of it—he was quite alone; and he had nothing to help him except the knife which his comrade had purposely dropped on the ledge of the window. For some minutes he was too stunned by the treachery of his friend to think about anything at all, but after a while he shook himself awake, and determined that he would manage to keep alive somehow, if it were only to revenge himself. So he put the knife in his pocket and went off to a part of the island which was not so bare as the rest, and had a small grove of trees. From one of these he cut himself a bow, which he strung with a piece of cord that had been left lying about the huts. When this was ready, the young man ran down to the shore and shot one or two seabirds, which he plucked and cooked for supper. In this way the months slipped by, and Christmas came around again. The evening before, the youth went down to the rocks and into the thicket, collecting all the driftwood the sea had washed up or the gale had blown down, and he piled it up in a great stack outside the door, so that he might not have to fetch any all the next day. As soon as his task was done, he paused and looked out toward the mainland, thinking of Christmas Eve last year, and the merry dance they had had. The night was still and cold, and by the help of the Northern Lights he could almost see across to the opposite coast, when suddenly he noticed a boat, which seemed to be steering straight for the island. At first he could hardly stand for joy, the chance of speaking to another man was so delightful; but as the boat drew near, there was something, he could not tell what, that was different from the boats which he had been used to all his life, and when it touched the shore, he saw that the people that filled it were beings of another world than ours. Then he hastily stepped behind the wood stack, and waited for what might happen next. The strange folk jumped onto the rocks one by one, each bearing a different bundle. Among the women he noticed two young girls, more beautiful and better dressed than any of the rest, carrying between them two great baskets full of provisions. The young man peeped out cautiously to see what all this crowd could be doing inside the tiny hut, but in a moment he drew back again, as the girls returned and looked about as if they wanted to find out what sort of a place the island was. Their sharp eyes soon discovered the form of a man crouching behind the bundles of sticks, and at first they felt a little frightened, and started as if they would run away. But the youth remained so still, that they took courage and laughed gaily to each other. "What a strange creature, let us see what he is made of," said one, and she stooped down and gave him a pinch. Now the young man had a pin sticking in the sleeve of his jacket, and the moment the girl's hand touched him she pricked it so sharply that the blood came. The girl screamed so loudly that the people all ran out of their huts to see what was the matter. But as soon as they caught sight of the man, they turned and fled in the other direction, and picking up the goods they had brought with them scampered as fast as they could down to the shore. In an instant, boat, people, and goods had vanished completely. In their hurry they had, however, forgotten two things: a bundle of keys which lay on the table, and the girl Whom the pin had pricked, and who now stood pale and helpless beside the wood stack. "You will have to make me your wife," she said at last, "for you have drawn my blood, and I belong to you." "Why not? I am quite willing," he answered. "But how do you suppose we can manage to live till summer comes around again?" "Do not be anxious about that," said the girl; "if you will only marry me, all will be well. I am very rich, and all my family are rich also." Then the young man gave her his promise to make her his wife. The girl fulfilled her part of the bargain, and food was plentiful on the island all through the long winter months, though the young man never knew how it got there. And by and by it was spring once more, and time for the fishing folk to sail from the mainland. "Where are we to go now?" asked the girl one day, when the sun seemed brighter and the wind softer than usual. "I do not care where I go," the young man answered. "What do you think ?" The girl replied that she would like to go somewhere right at the other end of the island, and build a house, far away from the huts of the fishing folk. And he agreed, and that very day they set off in search of a sheltered spot on the banks of a stream, so that it would he easy to get water. In a tiny hay on the opposite side of the island, they found the very thing which seemed to have been made on purpose for them; and as they were tired with their long walk, they laid themselves down on a hank of moss among some birches and prepared lo have a good night's rest, so as to be fresh for work the next day. But before she went to sleep, the girl turned to her husband and said, "If in your dreams you fancy that you hear strange noises, be sure you do not stir, or get up to see what it is." "Oh, it is not likely we shall hear any noises in such a quiet place," he answered, and fell sound asleep. Suddenly he was awakened by a great clatter about his ears, as if all the workmen in the world were sawing and hammering and building close to him. He was just going to spring up and go to see what it meant, when luckily he remembered his wife's words and lay still. But the time until morning seemed very long, and with the first ray of sun they both rose, and pushed aside the branches of the birch trees. There, in the very place they had chosen, stood a beautiful house— doors and windows, and everything all complete! "Now you must choose a spot for your cow stalls," said the girl when they had breakfasted off wild cherries; "and take care it is the proper size, neither too large nor too small." And the husband did as he was bid, though he wondered what use a cowhouse could be, as they had no cows to put in it. But as he was a little afraid of his wife, who knew so much more than he, he asked no questions. This night also he was awakened by the same sounds as before, and in the morning they found, near the stream, the most beautiful cowhouse that ever was seen, with stalls and milk pails and stools all complete; indeed, everything that a cowhouse could possibly want, except the cows Then the girl bade him measure out the ground for a storehouse and this, she said, might be as large as he pleased; and when the storehouse was ready she proposed that they should set off to pay her parents a visit. The old people welcomed them heartily, and summoned their neighbors for many miles around to a great feast in their honor in fact, for several weeks there was no work done on the farm at all; and at length the young man and his wife grew tired of so much play, and declared that they must return to their own home. But before they started on the journey, the wife whispered to her husband, "Take care to jump over the threshold as quick as you can, or it will he the worse for you." The young man listened to her words, and sprang over the threshold like an arrow from a how; and it was well he did, for no sooner was he on the other side, than his father-in-law threw a great hammer at him, which would have broken both his legs, if it had only touched them. When they had gone some distance on the road home, the girl turned to her husband and said; "Till you step inside the house, be sure you do not look back, whatever you may hear or see." And the husband promised, and for a while all was still; and he thought no more about the matter till he noticed at last that the nearer he drew to the house the louder grew the noise of the trampling of feet behind him. As he laid his hand upon the door he thought he was safe, and turned to look. There, sure enough, was a vast herd of cattle, which had been sent after him by his father-in-law when he found that his daughter had been cleverer than he. Half of the herd was already through the fence and cropping the grass on the banks of the stream, but half still remained outside and faded into nothing, even as he watched them. However, enough cattle were left to make the young man rich, and he and his wife lived happily together, except that every now and then the girl vanished from his sight, and never told him where she had been. For a long time he kept silence about it; but one day when he had been complaining of her absence, she said to him, "Dear husband, I am bound to go, even against my will, and there is only one way to stop me. Drive a nail into the threshold, and then I can never pass in or out. And so he did. 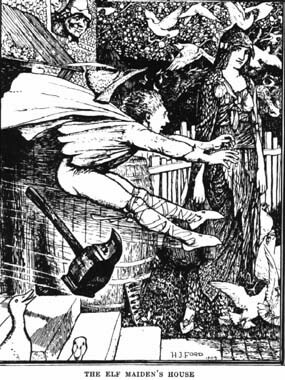 From Andrew Lang's Brown Fairy Book.